Kendall Genius 2 Thermometer. Measures temperature from the tympanic membrane, which shares the same blood flow as the hypothalamus, the body's natural thermostat. 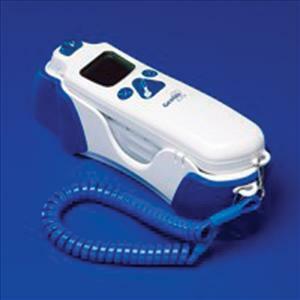 Utilizes infrared technology to derive the most accurate body temperature from the tympanic membrane. Records and analyzes up to 100 temperature measurements, and selects the highest and most accurate in less than 2 seconds, as compared to 32 in Genius and 1-8 measurements in competitive thermometers. Reduces the chance of an inaccurate reading due to improper technique or patient movement. Durable tip-based sensor technology. Improves durability and accuracy, minimizing the need for recalibration. Genius2 Thermometer.